The well known Black-headed gull (Chroicocephalus ridibundus Linnaeus, 1766) is a bird belonging to the order of the Charadriiforms (Charadriiformes), to the family of the Larids (Laridae), to the genus Chroicocephalus and to the species Chroicocephalus ridibundus. The name of the genus “chroicocephalus” comes from the old Greek “chroia, chroa” meaning colour, colour of the skin. 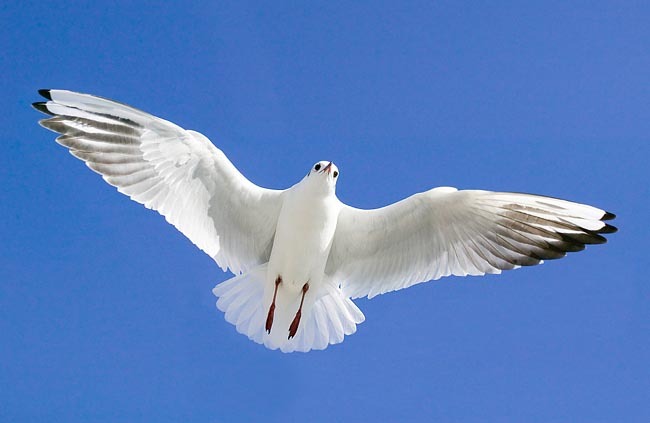 Therefore, the scientific term refers to a bird whose head (in Greek “kephale”, Latinized “cefalo”) can have a certain colour, which, in the case of the black-headed gull refers to the “hood” present in the summer livery of brown chocolate colour. The term “ridibundus”, relevant to the species, comes from the Latin and means “laughing scornfully” and refers to the vocalizations emitted by this species which can be very noisy especially when the flocks are eating, also by dusk or during the night. The most common call is formed by a single or repeated, with many variants, grating “krreearr” and by a short and sharp “kek” or “kekekek”. 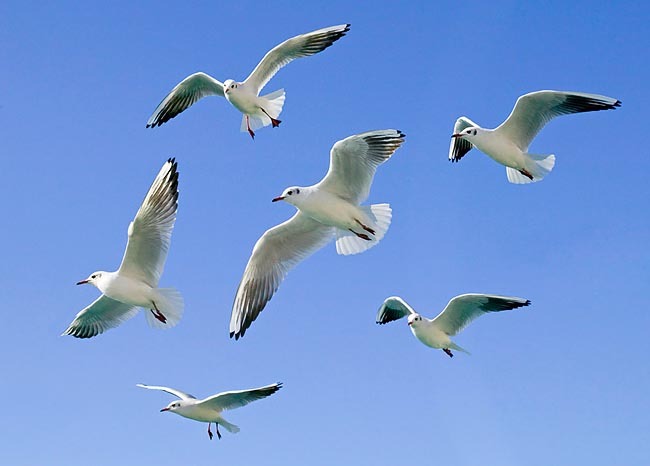 The black-headed gull is amply distributed in Europe, Asia and on the eastern coasts of Canada. It is a partial migrant as it retires from the most Nordic and iced zones in winter and keeping sedentary in other zones. The black-headed gull has colonial habits; it frequents usually lakes, rivers and their mouths, reed beds, wetlands and swampy zones but also islands, coastal dunes, salt pans and hinterland areas. Being an opportunistic species, it is easy to see it while feeding also in the countries where it takes advantage from the agricultural machines working the soil for predating earthworms, insects and various small animals. It frequents also dumping places, city parks and urban sites of various type where may be the possibility to find food of various types (also given directly by the persons) and where is possible to perch for spending the night safely. Thanks to the great adaptability, the distribution of this species has increased. Not being a pelagic species, even if frequenting the coasts, it is difficult to sight it, at sea, far offshore. The adult black-headed gull (starting from the second year of age), presents in summer a dark chocolate coloured hood interesting the face and the head in a characteristic way. The dark brown eye has a thin periocular ring of red skin and an outer periocular ring of white feathers. The white feathers of this last do not complete the round as they miss at the level of the median commissure of the eye itself. The neck, the chest and the belly are white as well as the tail. The dorsal part of the body (back and almost all the wing) is of pale grey colour. The outer border of the wing, for a belt starting from the alula and including the outer primaries, is white. This drawing is very useful for recognizing the species when flying. The tips of the primary rectrices and of the outer secondary rectrices are black; in the terminal black of the most median primaries is present a white “spot” evident also when the wings are closed. The bill and the legs, in this season, are red. In winter the livery is different. The most impressive difference stays in the absence of the dark hood; at its place, on the head, remain only two blackish-grey vertical stripes (at times, so much light to be reduced to two spots) on each side of the head, one of them reaches the eye and the other gets to the zone of the auricular hole, both leaving from the zone of the apex of the head. In winter, the legs and the bill are red or brown-red; the tip of the bill is black. The young of the year exhibits a livery with the presence of abundant brown-reddish colouration on the head as well as on the wings. Also the grey-blackish colour is quite present on the feathers of the back and on the coverts and rectrices of the wings where it forms scaly drawings. The tail, always on the young of the year, has a terminal black band. During the first winter after the birth, the young presents a strong reduction of the reddish colouration even if it keeps a certain dark spotting on the wings and the strike of the tail. The colouration, during the first summer after the birth, will be similar to that of the first winter with the addition of the hood which will not be complete like that in the adult specimens as in the chocolate brown is preent a variable quantity of white. Starting from the second year of life, the adult livery will be complete. This bird has a length of about 40 cm (37-44) and a wingspan of about 94-110 cm, weighs about 220-350 g and there is no evident sexual dimorphism; it is a very skilful and nimble flyer. 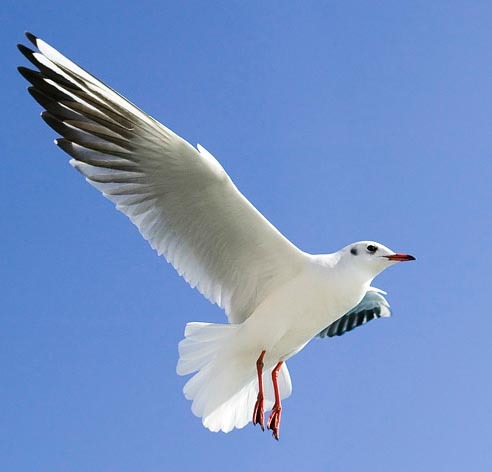 The black-headed gull has practically an omnivorous alimentation and has often the habit of stealing the food from other birds and also from its conspecifics (kleptoparasitism). In the humid and marine zones it actively looks for fishes, aquatic insects and generally small animals but its adaptative and opportunistic capacities render it able to take advantage from the most varied alimentary sources thus being practically able to nourish of whatever alimentary leftover found in the dumpings and in the urban areas. 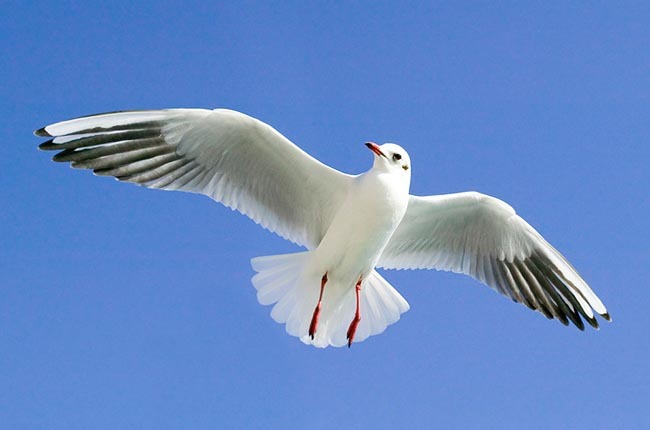 The reproductive range of this species of gull is very ample, extending from the southern point of Greenland to the whole Iceland, continuing through most of Europe and of Central Asia and reaching the Kamchatka Peninsula in Russia and north-eastern China. It is rarer in America. It reproduces preferably in great colonies, in the freshwater or brackish swamps. The reproductive territories are reached by early spring (February-March for Europe); first by the males who occupy the territories where to build the nest and then by the females who will have to chose the partners. Usually, the mating is preceded by the regurgitation of food done by the male in favour of the female. The formed pairs become territorial and defend the zone where the nest will be located; the defended surface will be of some square metres. The nest is formed by cup of vegetal material fairly well built; the eggs (1-3 per brood) are spawned between April and May. The eggs have a brown-mustard colouration and are spotted of brown; the brooding lasts 22-26 days. The pullets, which since already the first days of life have open eyes and are able to get off from the nest, are nourished with fish and other food regurgitated by the parents. The newborns have a brown-reddish colouration with yellowish reflections and are totally spotted of black. This mimetic colouration along with the capacity of hiding and of flattening on the ground at the least sign of danger helps them in the defence from the predators. The reproductive colonies may count from few pairs to thousands of specimens. The adults tend to get back, for the reproduction, to the colonies where they were born. → For general information about the Charadriiformes please click here. → To appreciate the biodiversity within the CHARADRIIFORMES please click here.